The festival was founded in 1999. Since then it's brought thousands of authors, and millions of pounds, to the local area. An arts event has celebrated ancient trading routes of the historical port and market place of Wigtown as part of the Book Festival. The celebration, on the 27th September, saw people travelling to the town by different methods of transport. Horses and carts, boats and cyclists made their way to the event for a parade and surprise performance in the evening. Events included drumming workshops, spoon crafting and flag making. "We became very aware that the festival’s organisation involved a lot of travelling to and from different places and how the journeys became part of the art experience. The Wigtown Book Festival is one of our region's great success stories, having boosted the area's local economy after a slump in the 1990s. Now in its sixteenth year, the festival goes from strength to strength, as Gill Brown found out. You can see more of Gill Brown's report on the Wigtown Book Festival in next week's Border Life. Viewers with Freeview can see it on ITV Border Scotland at 20:00 on Monday evening. If you're keen on books, Wigtown is the place to be for the next ten days. The town's celebrated book festival is underway, and the Festival Manager says there are plenty of attractions at this year's event. You can see more by watching Border Life, episode 29. 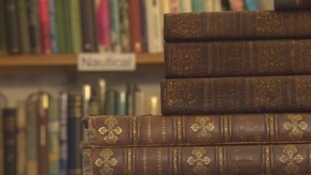 Up to 20,000 people are expected to visit Wigtown from today for its celebrated book festival. The event has become the biggest of its kind in Scotland and attracts some of the UK's top writers. More than 150 events will take place over 10 days days.